First off, I have to say that I am in no way (as far as I know) related to Bob Fingerman. I actually discovered his existence when I was googling my name (yes, I do that occasionally). I became a fan after reading his novel Bottomfeeder. 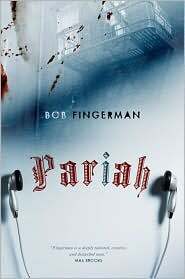 I became a bigger fan after reading Pariah. He’s probably more famous for his graphic novels, but I digress (plus, I haven’t read any of his graphic novels yet). Zombies have taken over the world. How? Dunno. What happened? Dunno. Initially, I was a bit disappointed that there was no answer. The story focuses on a small handful of New York survivors trapped in their Upper East Side apartment building. Shoulder-to-shoulder, zombies surround their entire universe. With no communication to the outside world, if there is an outside world, the survivors, thus the reader, only know what’s going on in the here and now. They didn’t know how it all happened other than it was quick. So as long as they didn’t have any inside information that I didn’t, all was forgiven. I could live without those answers. Hopelessness reigns with starvation gaining fast. As the few left are coming to terms with their fate, from out of nowhere appears Mona, a girl who can freely walk among the undead. Where did she come from? Dunno. Where was she going? Dunno. But she agrees to make a food and supply run and move into one of the unoccupied apartments. Suddenly there is hope, but for how long? Will the group ruin a good thing trying to figure out how she can move freely while they’re stuck in their prison? Pariah is a tension filled, fast-paced novel (which says a lot considering that these are the breed of zombies that don’t move too fast). There are a number of questions brought up ~ some answered/some not. Some of the non-answers I felt fine about, others I felt put off. I really wanted to know. I guess that’s a credit to the author because I was that into his characters. Fingerman writes a colorful cast of survivors and his warped sense of humor is sprinkled not so delicately throughout. Yes ~ Eddie is on the roof of his building fishing for zombies. Fingerman convinced my sense of disbelief that the world as I know it is over.